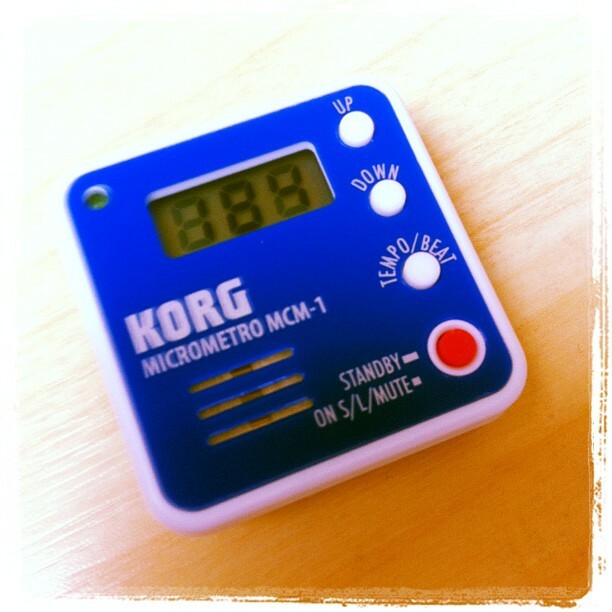 One hundred and eighty-four electronic bleeps per minute accompanied my run this morning as I tested a new training aid – a metronome. Each bleep matched a footfall, targeting a cadence in that magic ninety to one hundred region elite runners inhabit. They proved remarkably engaging, my mind focused on holding the rhythm, the run felt fast, but controlled. This sample of one is encouraging, the metronome will likely become a regular running companion. I’ve occasionally flirted with the issue of cadence. Far in the past, as I trained to be a better runner, I worked to achieve that golden ninety footfalls; once there I never gave it another thought. New to cycling, I routinely encountered advice to spin, 90 rpm, it was what Lance Armstrong would do; I followed, I tried and eventually I stopped worrying. In the water the advice was about distance per stroke, not strokes per minute; the idea of controlling the rate never entered my head. Cadence was never a major concern, I adopted what was comfortable and fast. You can be too comfortable. Swim Smooth introduced me to the Wetronome, a waterproof, bleeping box that could set a tempo for your stroke. Stroke length was important, but so was stroke rate; if two swimmers move a metre every stroke then the one who does seventy per minute covers ten metres more than the one who does sixty. Testing showed I gravitated towards sixty, but could maintain form at seventy – I was missing speed. I incorporated a Wetronome and started training stroke rate to gain those extra seconds; inevitably use of the Wetronome faded with time, but the important of stroke rate didn’t. At my fittest I easily controlled my pace through my stroke rate, able to raise it without significant impact on distance per stroke. In my current condition I struggle to combine good technique with high turn over, so I concentrate on developing the fitness that will enable me to work on stroke rate once more. I am cadence aware, but not obsessed. As I rode longer, hillier and harder I headed in the opposite direction, my natural cadence dropped. Power output remained unaffected, but on longer rides I naturally preferred a lower cadence, ninety felt uncomfortable, tiring. 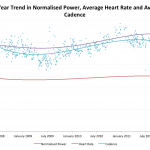 Cadence was always an option on my bike computer, but I chose to ignore it, instead concentrating on wattage and heart rate. I played, a winter spent only in the little ring was interesting, but had little influence on the year ahead (positive or negative); adjusting gears on steady state rides showed the right cadence simply felt better. I didn’t aim for a golden rule, instead I strived to learn the turnover my body preferred. I remain largely ignorant of my cycling cadence, I’m aware of power, heart rate and how my legs feel. It seems to work. After a few months of training ninety felt natural when running, so I paid little attention to cadence. Six years later, when I acquired a Garmin Footpod, it confirmed I still tended towards ninety strides per minute, give or take. 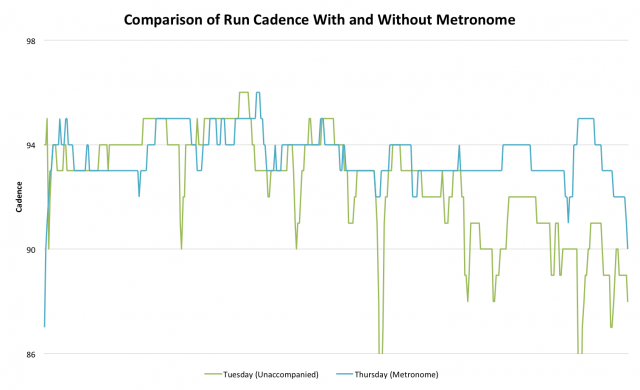 If James hadn’t suggested it during my last Kinetic Revolution track session I wouldn’t have considered running with a metronome, after all, I was already in the right region, but there are dips – fatigue takes it’s toll and momentary lapses in concentration see the cadence drop – if nothing else it would ensure consistency. What was surprising was the change it brought to my entire run; concentrating on the bleep pulled each aspect of my technique in line – I felt I was running better. Feelings and a sample size of one – not ideal. I ran the same thirty minute route on Tuesday and Thursday this week, the first unaccompanied and the second with metronome. As the graph shows they both occupy a narrow cadence range, but the difference is consistency – with the metronome everything is a little more crisp and controlled; the beat guides me. To further this anecdotal evidence I will note that while I was fresher on Tuesday it was then my cadence fell towards the end of the run. Fatigue would predict Thursday to be the day I struggled, but the bleeps kept me honest. So my flirtation with cadence continues, perhaps a little more seriously than before. I remain ambivalent in cycling, there is sufficient discussion to leave me unconcerned at my lower cadence while I can comfortably produce the power. I know I will need a higher arm turnover in the pool and await the full development of my fitness to enable it. And I continue to run around ninety, just a little more consistently with the aid of the metronome.